Area Habitat: open land 26.31%, forest 73.68%, wetland 0.04%, open water 0.01%. State hunting license, iSportsman account and Fort Campbell permit are required. 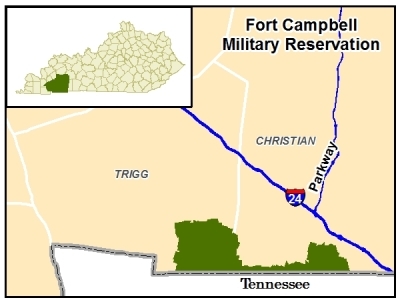 Civilian hunters must complete an annual criminal background check and register their firearms at Fort Campbell Visitor Center (located at Gate 4 or Gate 7). Following background check, hunters must be validated at Fort Campbell Fish and Wildlife office. Hunters must have proof of successful completion of a state-approved hunter safety course no matter age. Youth hunters must be at least 9 years old to harvest an animal. Youth under 9 years old may go hunting with an adult, but are not authorized to harvest an animal. Kentucky hunters may hunt on both the Kentucky and Tennessee portions of the base. Turkeys taken are bonus birds. Consult website or contact office for dates. For more information visit https://ftcampbell.isportsman.net. 15 miles south of Hopkinsville on US 41A. Hunting permits and information available at Bldg. #6645, near road intersection of Woodlawn and Lafayette. Vast system of inter-post roads, some hard surfaced. Terrain varies from gently rolling to steeply hilly, with a variety of forest wildlife and farm habitat, sinkholes and beaver lakes that attract wood ducks and shorebirds. Trout streams available and 2 lakes with warm water fish species (permit required). Post also provides courses for bird-dog field trials.